The Office of Fair Trading has threatened to take legal action against airlines in an attempt to tackle what it says is misleading pricing. The BBC has found that several low-cost airlines are still quoting fares without including extras such as taxes. In February, the OFT gave carriers and travel companies three months to include all fixed non-optional costs in their basic advertised prices. 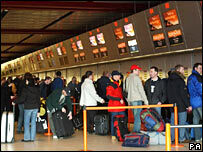 Easyjet, Ryanair and Thomas Cook say they are working towards compliance. The extra costs which concern the OFT include items such as air passenger tax and fuel surcharges, all of which can significantly change the price of a flight. Ray Hall, from the OFT, said such pricing was "leading consumers to make the wrong choices". "We have given the airline industry a deadline to make changes - some have complied, some haven't," he said. The OFT said a minority of airlines had failed to comply, although it will not name them. However, the BBC has found that several low-cost carriers are still quoting flight prices without including those extras on their websites. Easyjet said that by the end of the summer all prices given on its website would include taxes and charges. Prices quoted in billboard and press advertisements already included extra charges, it added. Ryanair said it had changed all the prices on its website's home page to include extra costs, and would change the rest of the site by the end of the year. Flythomascook said it expected to comply with the OFT by the end of July. Leeds-based Jet2 said it was talking to the OFT about how best to present its prices. A spokeswoman for the budget airline said it was a particularly complicated process due to the large number of routes and different types of taxes and airport charges. If the OFT is not happy with progress, it can take companies to court to make them change.